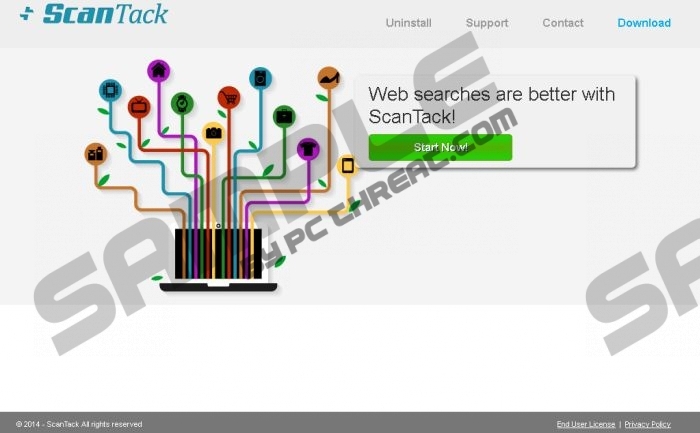 Instead of promoting ScanTack on its official download page, the developer of the application has chosen the services of third-party software publishers. Just like Bomlabio, Okiitan, PlurPush, and other SuperWeb applications which require removal as well, ScanTack always comes bundled with some random third-party installers. Do you think this is not something you should worry about? If so – you are completely wrong. Authentic software distributors use bundled installers, but schemers may use them as well. It is quite possible that the third party advertisers who are affiliated to the suspicious extension will make sure to attach it to some unreliable freeware installers. Needless to say, this activity is highly suspicious because it may lead to the infiltration of other programs you will need to delete. The cookies installed by ScanTack are meant to discover what you are interested in, how you browse the web and what information you might be allured to. This kind of data is shared with the affiliated advertisers, and they use it to display supposedly useful offers. Needless to say, it would be great to find a profitable deal on a product you have randomly researched. Unfortunately, this is not exactly how ScanTack works. It is quite unlikely that you will be presented with beneficial deals or coupons, as offers to install unfamiliar programs, reveal personal information or use some suspicious services will flood instead. Besides being useless, these offers could even hide links to corrupted websites. You can delete ScanTack from the operating system manually or you can use automatic malware removal software instead. We are sure you realize which of the options is considered to be more beneficial. If you follow the manual removal guides, only the visible portion of the undesirable program will be deleted. What is more, other potentially existing threats will continue running. Therefore, you should click the download button below and acquire a legitimate security tool/malware remover. Right-click on the Metro UI screen to open a pane at the bottom. Select All apps, then open the Control Panel and go to Uninstall a program. Right-click the program you wish to delete from Windows and select Uninstall. Click the Start (Windows) menu icon on the left of the Task Bar. In the appeared menu select Control Panel and click Uninstall a program. Right-click the program you wish to delete and then select Uninstall. Move to the left of the Task Bar and click the Start button. Remove the undesirable application to disable its activity. Quick & tested solution for ScanTack removal.